This is my favourite sweet pongal recipe. Rice and dal cooked with the ingredients like edible camphor,elachi, nutmeg and elachi make it smell and taste DIVINELY. This is my mom’s staple recipe. I made this few times now and got appreciation too from everyone when I made it for our home Grahapravesham at Kumbakonam. So from then I wanted to post it here in my blog. I already have a sakkarai pongal recipe in my ulundu vadai post. But its plain and simple without all those special spices. I have made this in pressure cooker, but can be made in the traditional way by boiling rice and dal and adding jaggery to it too. Before marriage, me, my mom and our neighbour used to do this pongal in pot in a temple (Kottai mariyamman koil) in Salem. Every month we used to carry the ingredients and make pongal back of the temple, offer it to god and after that we distribute all the pongal there itself in the temple. We just take a ladle full for ourselves. Other than that we distribute everything there. The vengala pot gets empty in no time. We come back home with heart full of satisfaction . * Use edible camphor very little, if you add more, it may spoil the whole taste with over flavour. Use a fenugreek seed size alone. Take pressure cooker/ pan, add 1/4 tsp ghee and roast the moong dal. Add water, washed rice and salt. Pressure cook for 4 whistles. Mash it once done. Powder jaggery and heat it with water just to immerse it and bring to boil. Let the jaggery completely dissolve and filter it and add to the mashed rice in the cooker. In a separate pan, heat a tsp of ghee and roast cashews to golden and add raisins to it. Once it fluffs up, transfer it and keep aside. In the same pan, add cloves, elachi and switch off the stove. Add nutmeg powder, give a quick stir. Take out elachi and powder it, add the powdered elachi, edible camphor, cloves along with nutmeg powder to the pongal. Mix well and cook in medium flame for 5 minutes. Add 1/4 cup water or milk if it gets dry while cooking. Add ghee little by little while cooking. Lastly add the fried cashews and raisins. I used old rice, so needed water at the ratio of 1 : 5. If your rice is new and gets cooked easily, 1 : 4 is enough for this pressure cooker method. After cooling down, gets thick, so switch off the flame accordingly. I grate nutmeg and roast it in ghee while I roast cloves/elachi / cashews. When you do so, you should make sure to add the grated nutmeg after you switch off the stove. Otherwise, it may get burnt. Use good quality ghee. I always use homemade ghee. As a kid this is the only payasam that I used to make. Reminds me of those wonderful childhood days. My grandfather used to like it. Too good and love the clicks. Am loving the cashews and raisins…looks so delicious.. 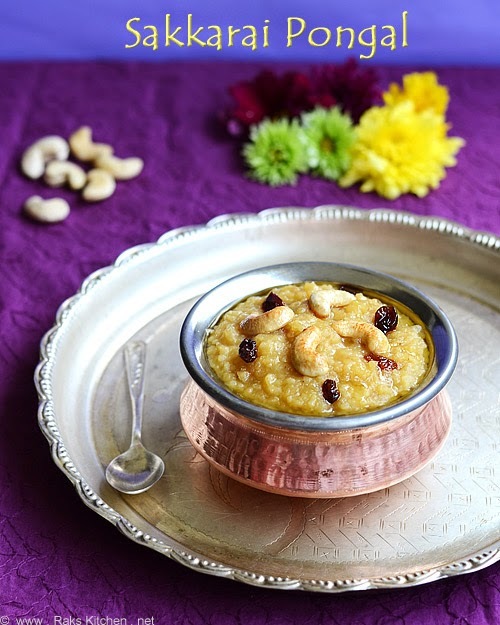 Such a droolworthy and super tempting sweet pongal, love it. My Fav too. Drooling here looking at the ghee soaked Pongal. Looks divine..I remember the Pongal festival..
Raks the pic looks so colourful lovely sooooooooo good and tempting. OMG pongal looks very yummy.Its really makes me drooling Radhika. A delicious traditional dish. I have made it with quinoa and brown rice too. Yours looks so delicious with all the goodness in it. Very rich pongal, looks divine. can u pls tel me how do u slice the nuts especially the one u did in ur carrot halwa post? The pongal looks super delicious, how I wish I could now have a bowl of it. Nice photos and detailed recipe.I tried this today and enjoying the house filled with its aroma. I normally use milk and it gets very messy. Oh…I love this! My Sakkari Pongal was never this good! wow.. mouth watering, btw awesome…. Wow! Thanks – just needed by me. thanks raks. the pongal was very taste. Totally agree on Use good quality ghee. I always use homemade ghee. That's so true. Your pongal looks divine! Looks delicious Raji..Will try this soon…From ur post i remembered the time when we used to go to temple(same kottai mariamman temple.. my native is salem) and keep this pongal during festival days(adi festival) with mom. Hi Raks..made this yesterday, as usual another perfect and delicious recipe..!thanks a lot.. Same here, will try it on 14th, tomorrow:) Happy pongal to you all!!! Hi raks, pls tell me wats elachi ,nutmeg powder and camphor u ve used is specially madeones for cooking isit??? elachi is cardamom and the other two are also for flavor. its available in stores. Hi.Raje,It brings back the sweet memories as you have said,with in no time sakkarai pongal would vanish in the dovotees thronging the temple .But the satisfaction remains always. You can use half and half milk and water. That is replace half water with milk. Very easy steps and preparations Raksitchen. Thank you for this recipe. I have tried it three times and each version was as good as the previous one. Only problem is I didn't use nutmeg and camphor as I couldn't find it anywhere in Tekka. Can I know where you purchased these two items? Felt nice to see the words "Kottai Mariyamman Kovil" 🙂 Will try this recipe tomorrow. Thanks! Thanks! Will buy them and try it with all ingredients next time. The Pongal looks delicious! I want to make this tomorrow. Did you add milk to it or just water? If you want to make with milk, reduce water and add milk half the amount of water. Thank you Raks, I tried this yesterday, so delicious.. everybody loved it.. Thanks for amazing recipe. Tried and turned yummy!! Tasted like the ones in temple… Made my festival a big hit!!! Tried it for the first time and it came out very well. Tried it today, it was yummy. My mom was totally surprised at the taste…as I had done without asking her….